ETU / Hottgenroth Software introduces a new mobile App for acquiring building data on a smartphone or tablet. The app is being used to record on-site room-dimensions and draw a quick floorplan using your fingertip. You can enter windows, doors, radiators, valves, boilers and storage equipment as well as room-labels and zones while walking through the building. 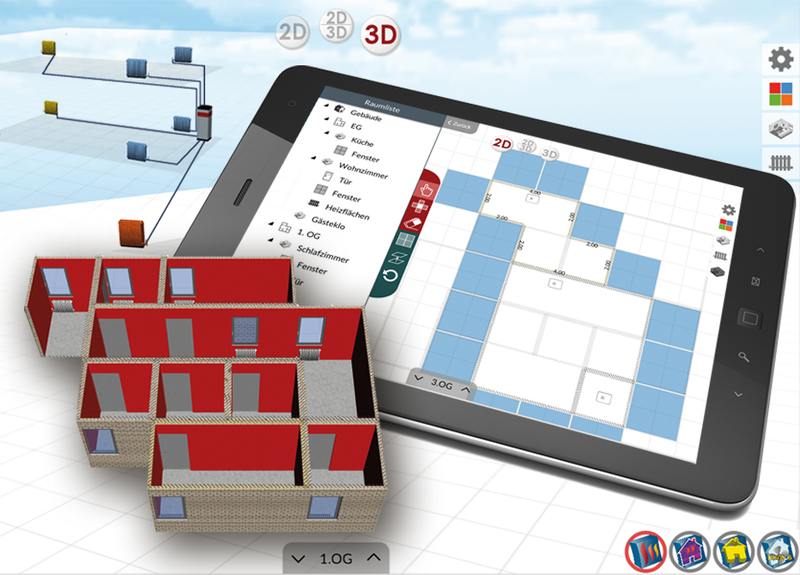 The data is send to your desktop through a cloud connection in order to create a 3D model of the building with HottCAD. Next you can calculate the heat-loss per room and you can balance the hydraulics of the heating system using our Optimus Duo 3D (PLUS) software. Note: Lastest version of Optimus Duo 3D/3D PLUS is required. Maximum of 10 App licenses per Optimus Duo license. Data acquisition assistant with default values and tools to create areas. Detailed tabular data acquisition or comparable data input. Intelligent data interchange between programms marked by this symbol. A common data model including CAD forms the core of our software. Your benefit: collect once – use repeatedly! All products marked with this label correspond to each other and take advantage of the BIM methodology. Others talk about BIM - we act!